ENTER TO WIN the "Cutest Small Dog Costumes for Maltese Photo Contest"
Looking for the best costumes for small dogs? My Maltese dogs Marley and Disco love to get dressed up in their Halloween pet costumes. They could care less about what they're wearing, as long as they get the extra attention a cute dog costume supplies. To ensure they get the attention they deserve, I am always on the lookout for the most adorable small pet costumes. Of course if my Maltese could talk, they would tell me to get something comfortable as well. Halloween Pet Costume or Holiday Dog Costume? Myself and other dog lovers have looked far and wide to find the best small dog costumes. Whether you're looking for a dog Halloween costume or a holiday dog costume for another event, we'll show you where to find the cutest and most comfortable. Check out the most popular dog costumes below or see pictures of other Maltese dogs wearing their favorite costume. Is your dog ready to get into the Christmas spirit? Why not put your little pup in a Christmas pet costume to show some holiday cheer? Small dogs always look good in little green elf costumes and they make the cutest Santa paws ever! Sometimes you can even find reindeer antlers and elf ears if your Maltese isn't ready to commit to the full holiday dog costume. WIN A FREE copy of my ebook "Complete Maltese Care Made Simple" by entering the contest below. Click here to see the rules and regulations. If you've ever put a costume on your Maltese, your "dressed up doggie" could be famous! Please tell us all about the small dog costume you selected for your Maltese. Did your dog like it or hate it? Where did you get it? Would you recommend this costume to other Maltese dog lovers? Submissions must include at least 200 words of text and a picture to be accepted. Thanks! Millie & her big sister Aubrey dressed as Peacocks! 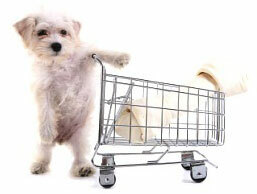 Looking for more Maltese dog gifts and supplies?